The James Theatre is the oldest purpose-built cinema still operating in Australia! But it is much more than that. The James Theatre is a multi-purpose facility hosting films, live performances, dance and film classes and is available for private functions, weddings, educational purposes and events. 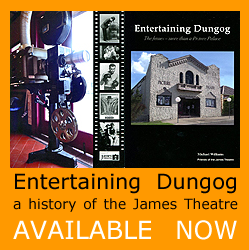 It is owned by the Dungog Shire Council and its day to day operation is managed by the James Theatre Committee. Donations: The Theatre is a large, grand and very old lady. Donations are welcome to assist with restoration and maintenance and will be gratefully acknowledged. Please contact us. Operations: Enquires to operate the cinema or to discuss any other business proposal please phone the booking officer on 0447 773 277 or use the Contact Us form. The Friends of James Theatre Inc promotes and runs many films and events at the James Theatre throughout the year. The Friends of the James Theatre was set up in July 2011 with the dual roles of undertaking the restoration of the Theatre and promoting its use. Renovations to the Theatre have been undertaken with funding assistance from the Community Builders program, Arts New South Wales, Southern Phone, Dungog IGA, as well as contributions from other local businesses, local fundraising and donations from residents. We rely entirely on volunteers and acknowledge the assistance of the Dungog Shire Council and Mr Michael Johnsen MP, Member for Upper Hunter. The Friends is a large undertaking and operates in small sub-groups. Apart from the executive committee these include: the Projection Group, responsible for all movie screenings at the Theatre; the Film Selection Group which runs film screenings, as well as Agog and Flickerfest Film Festivals; the Promotions Group responsible for promoting all events at the Theatre; the Kiosk and Catering Group and the Events Group. The Friends can provide help if you wish to bring a performance to the Theatre. Please use the Contact Us form. Membership keeps you in touch with our activities, gives you advance notice of our events and the earliest opportunity to buy tickets. If you would like a more active role, we are always wanting willing volunteers for work parties or to put on events whether live or film. Please use the Contact Us form and we will send you the membership information. Suggestions: The Friends welcome any constructive suggestions, feedback or comments. Please use the Contact Us form.